Made to pair with the CMMG Mil Spec upper conversion kit that converts a standard AR-15 to .22LR. This is a proven magazine that functions incredibly well-in fact it set the standard as the earliest fully functional conversion kit and it has had a distinctly reliable record of service for the popular conversion kits. 25 round capacity and a whole bevy of specific features that make this magazine the de-facto standard for AR .22LR conversions. A high quality plastic follower and a plastic body made with exceptional quality polymers to ensure high reliability, these are the finest quality magazines available for .22LR conversions on the AR platform. The durable polymer construction of this magazine is right in line with the robust nature of the mil-spec components your AR is famous for. The size and shape of this magazine is the same as the standard 30 round AR magazine, so all your normal magazine accessories and pouches work well with it. The strong follower offers a bolt hold open. CMMG has legendary service and product quality and have been standing behind their products regardless of the concern. 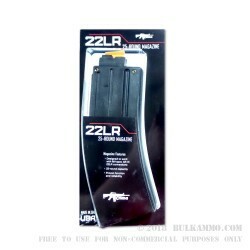 These .22LR mags are guaranteed to work.